Japan is one of the leaders of gay rights in Asia. Surprising isn't it? Japanese society is so regimented, conservative, with strict social norms and little room for acceptance for anything different. Despite this, Japan (along with Taiwan) is one of the few countries in Asia which has truly started to accept and protect its gay community to the point where it's opened the door to gay civil unions. We enjoyed our time there so much that we decided to write our LGBT travel guide to Japan's capital city. Before heading off, don't forget to pre-order your pocket WiFi so you can stay online throughout your trip in Japan. The pocket WiFi will save you a lot of money on roaming fees. Check out our guide to renting pocket WiFi in Japan. Where to eat in Tokyo? 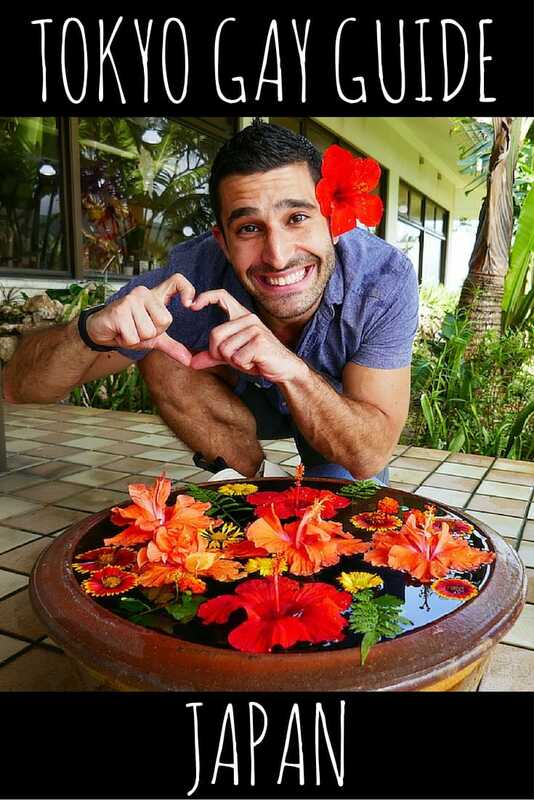 Looking for a gay travel agent? Gay Tokyo is mainly congregated in Shinjuku's Ni-chōme (Area 2) where all the action happens. Shinjuku is a major transport, located in Central Tokyo, towards the west of the famous Imperial Palace. The station itself is like a mini city, with over 200 exits, serving over 3 million people daily, making it the world's busiest station. Shinjuku is so big that it's directly connected to 5 other nearby stations, so definitely plan ahead where you're heading exactly before coming here, otherwise you'll get completely lost. We advise downloading the Tokyo subway map on your smartphone or view it here. Shinjuku-Gyoenmae: served by the Marunouchi Line only. The metro system in Tokyo is very easy to use and everything is displayed in English. However, it gets very busy! To avoid the queues at the ticket machines and save money, pre-order a Tokyo metro pass which will give you unlimited access to all Tokyo Metro and Toei Subway lines. Hotel delivery is included. 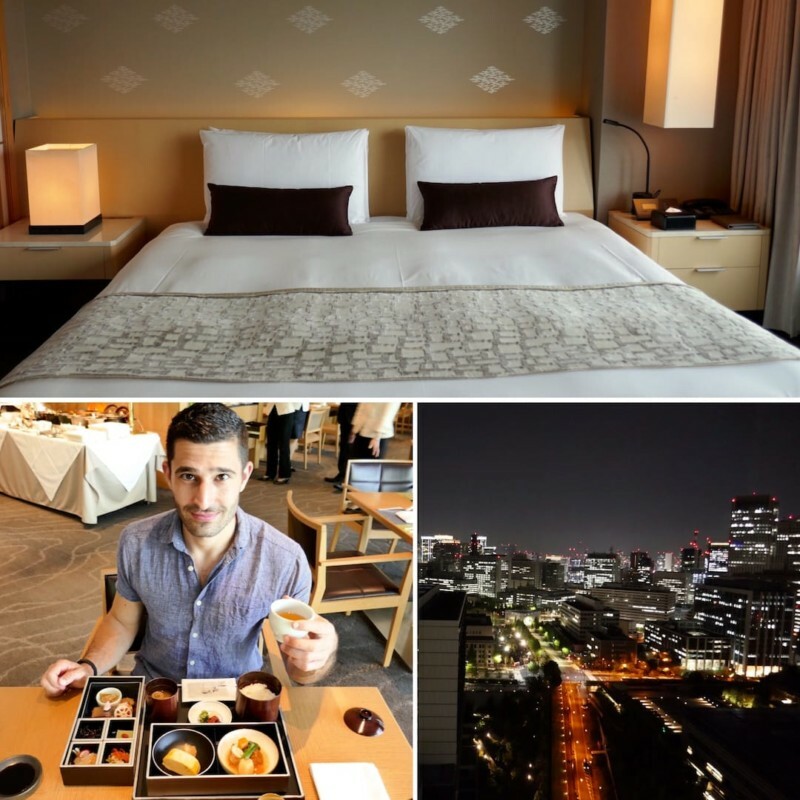 We stayed in a few places in Tokyo and these are our favourite gay friendly options both in Shinjuku and around below. 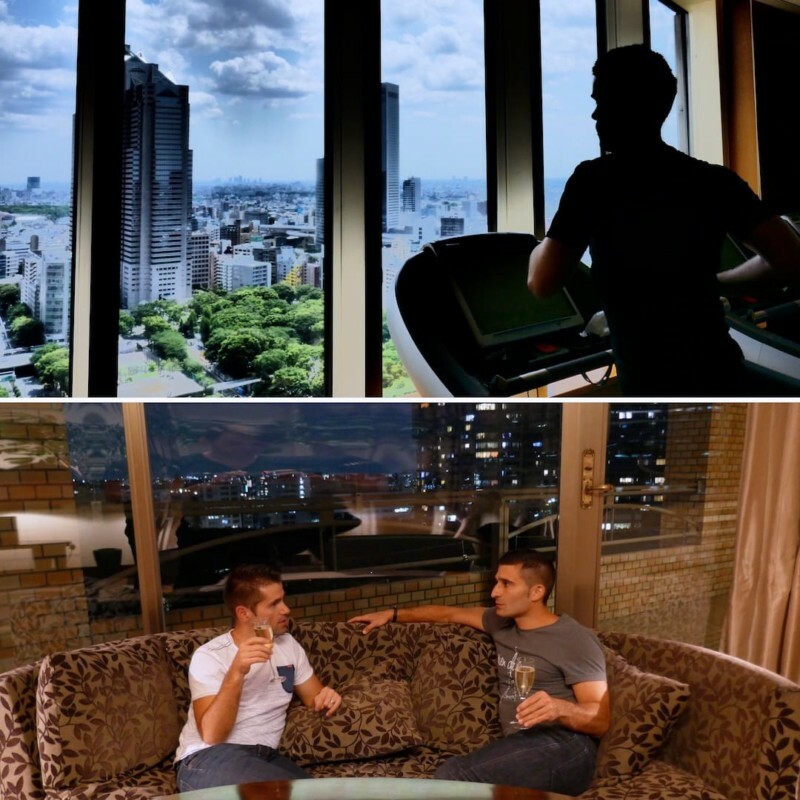 For a more in-depth guide, be sure to check out our 10 best gay hotels in Tokyo. This is our favorite hotel to stay in Tokyo. We loved the modern architecture of the hotel, a perfect blend of western and Japanese influcences. The rooms are innovatively designed in open space to give you a soothing experience, with gorgeous views and a rain shower to die for. A luxury and romantic experience not to miss. It is located in central Tokyo, right next to the Imperial Palace, with a subway station (Tameike-Sanno) in the basement giving you access to 4 metro lines. The breakfast is fabulously delicious, with a choice of Western or traditional Japanese. Rooms at the Capitol Hotel Tokyu start from 44,150 yen ($415). This is elegance and style in the heart of Shinjuku and also very close to the Ni-Chōme gay bars: 10 minutes by taxi or a 20 minutes walk. As well as being plush, classy and super trendy, this was also the location for the Bill Murray and Scarlett Johansson Lost In Translation film, particularly the The New York Bar on the 52nd floor. The views across the city from here are ethereal! Rooms in the Park Hyatt start from 48,000 yen ($450). The Hyatt Regency is a more affordable option in Shinjuku but still luxurious with a blow-your-mind entrance, popular with wedding receptions and photoshoots. It's located 5-10 minutes by taxi or 20 minutes walk to the gay bars of Shinjuku. The pool, jacuzzi and gym are located high up so you can work out with a beautiful view. The club lounge is the perfect spot for a light bite and a few drinks before hitting the gay bars of Ni-Chōme. Rooms start from 27,000 yen ($247) a night. Imano Hostel is a decent budget option if you don't mind sleeping in dorm beds. They have curtains to close off your area, which makes them more like cubicles than an actual dorm. Imano is located minutes walking distance from the gay bars as well as the Shinjuku-sanchome metro. It's not an exclusively gay hostel, but welcomes us; given its location so close to the gay bars of 2-Chōme, it's hardly surprising! Dorm beds start from 3,500 yen ($32) a night. Shinjuku's Ni-Chōme is famous for having the world's highest concentration of gay bars with over 300 crammed together. It can be quite overwhelming, so it might pay to have a private gay guide to show you around. We discovered an excellent local company who offer private evening tours of the gay scene with a gay English speaking guide. Tours cost 20,000 yen ($200) per person, lasts for 3 hours and includes dinner and 1 drink in 1 of the gay bars during the tour. 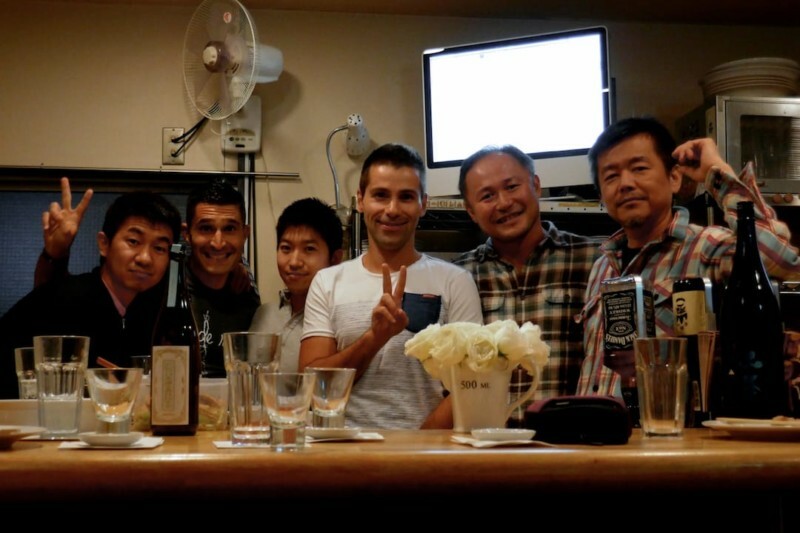 If you would also like to do a gay evening tour of Tokyo, complete the form below for more information. Most of these 300 bars are tiny, squeezed into unremarkable blocks. For example Usagi Bar is located on the 4th floor of a block (address: Shinjuku 2-10-2, Ebana Bldg 4F). When you arrive on the 4th floor, it's a corridor of doors – as if you're going to your friend's party in his flat. But go through the door and a tiny bar reveals itself. These bars have a warm, friendly atmosphere, centred around the bar man, who is usually the owner (or mama-san in Japanese gay slang). Usually everyone knows everyone, and sometimes they bring home cooked food to share around. Arty Farty: popular bar open from 6pm-1am. Most come here for a few drinks, then later on head to sister club Annex next door. It attracts an even mix of foreigners and locals. It's open everyday till 1am. Campy! Bar: very cool, colourful and welcoming bar, run by celebrity cross-dresser called “Bourbonne“. The staff are all dolled up in drag, which adds to the fun atmosphere. It has really funny shows taking place throughout the evening. Campy! is open every day till midnight. AiiRo Cafe Bar: popular bar for drinks any day of the week open till late. It is easily identifiable by the large “Torri” (Japanese Shrine) outside. Look out for their 1,000 yen ($9) Beer Blast all-you-can-drink happy hour, daily between 6-9pm. AiiRo is open everyday until 2am, and on weekends until 5am. Leo Lounge: large popular bear bar, which welcomes everyone. We love the friendly atmosphere here and came back many times. It's also a great place for karaoke. Leo Lounge is open everyday (except Tuesdays) until 5am. 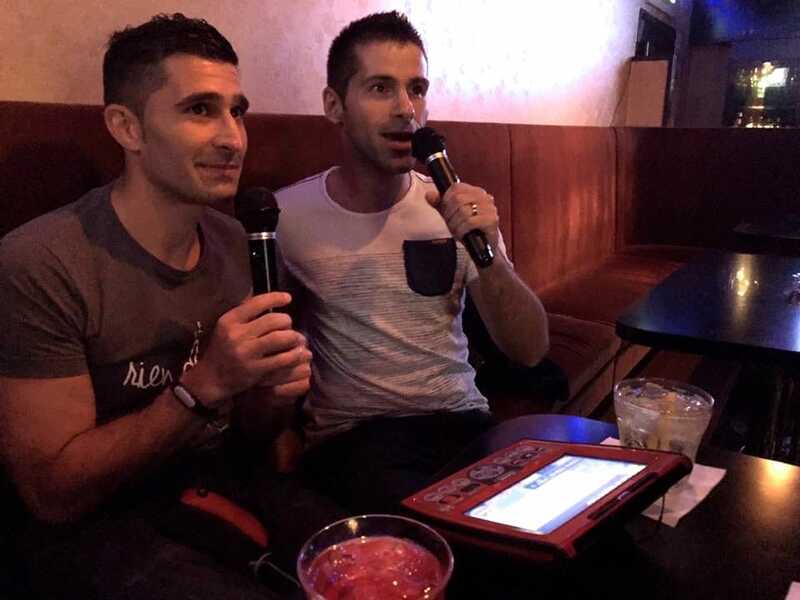 FTM Bois Bar: No charge, free karaoke, free popcorn…what's not to love? FTM Bois is an excellent bar for the transexual community run by cutie FTM called Mizuki. It is open only on Monday evenings until 2am. The Annex: club open till 4am, owned by the same guys behind Arty Farty, which attracts a young crowd in their 20s and 30s. If you get stamped in Arty Farty, you can get in here free without paying entry twice. It's open till the early hours of the next morning. Look out for their Circuit after parties on weekends which go till 11am the next day. Dragon Men: draws a mixed crowd of expats, foreigners and locals, great for a few cocktails and a boogie. It has a happy hour of 200 yen off all drinks from Monday to Thursday 6-8pm. Dragon Men is open everyday until 3am, on weekend till 5am. Alamas: owned by the same guys behind AiiRo Cafe and have daily parties with a live DJ so check their schedules. Tokyo Rainbow Pride: takes place every April/May during the Japanese Golden Week holiday. The climax is the large parade, which culminates at Yoyogi Park with lots of parties and events taking place alongside it. Rainbow Reel Tokyo: is the city's official LGBTQ film festival, which started in 1992. It takes place every July, featuring LGBTQ films from around the world. For more up to date information of all gay events in Tokyo including monthly parties and Circuit events, check out the listings on DailyXtraTravel. 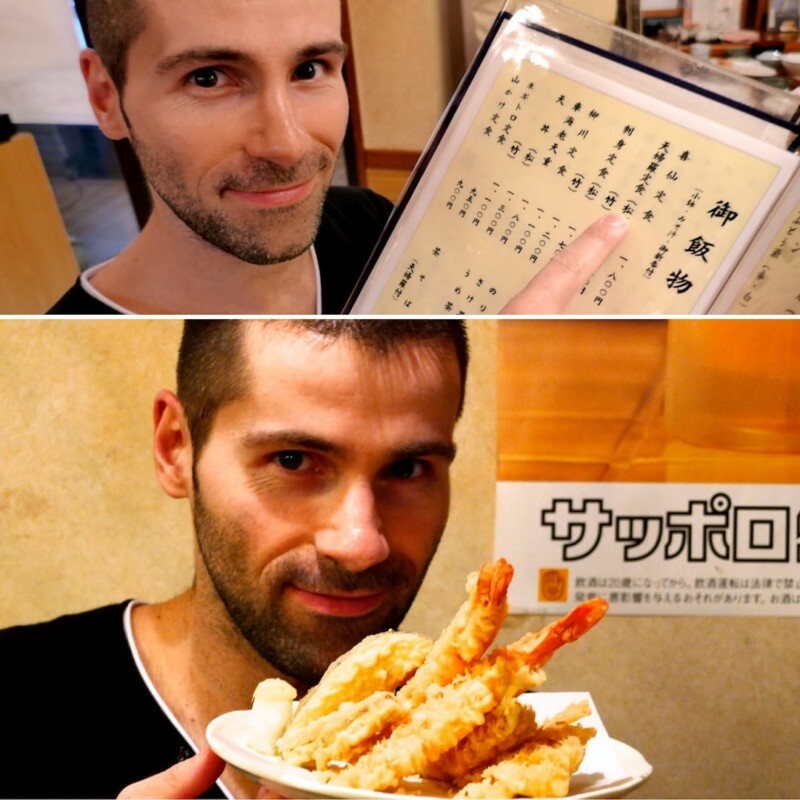 Food Tour: an excellent way to discover downtown Tokyo and dive straight into some of the best izakayas (gastropubs). We highly recommend Arigato Food Tours ($120 per person) who will show you the best izakayas in Ginza, Yurakucho and Shinbashi. Onsens: an experience not to miss! An onsen is a public bath where you bathe in various pools of water sourced from hot springs. They're the perfect way to conquer jet lag. Our favourite is the Maenohara Onsen (1180 yen/$11 per person), closest metro is Shimura-sakaue metro. There's also a gay onsen chain in Shinjuku called 24 Kaikan, targeted more to cruising and can also be found in Ueno and Asakusa. Transform into a geisha: what better way to discover more about the elusive geisha then to transform into one at the Studio Geisha Cafe. This is an experience of a lifetime and certainly one of our favourite unique things you can do in Tokyo. Cooking class: learn to make sushi, bento box and more in a cooking class with the excellent Arigato Japan Cooking School ($75 per person). Shibuya crossing: this famous pedestrian intersection outside Shibuya Station is the perfect place to get a real feel of the immense world of Tokyo. When the road signs turn red, an invasion of bodies take over the entire area. Quirky Tokyo: Tokyo is renowned for some really quirky fashion and alternative attractions, such as stroking felines while drinking your coffee at the Cat Cafe Calico in Shinjuku, or feeding owls at the Owl Cafe Mohumohu in Shinjuku. Takeshita Street in Harajuku: this is the place to spot grown up women dressed up as manga characters or schoolgirls. For more, check out 8 quirky and interesting facts about Japan. Sushi mania at Toyosu fish market: Tokyo is THE place to come for the best sushi, specifically at the restaurants around Toyosu – the world's largest fish market. The market caters to the nearby restaurants, so they inevitably serve up the most delicious, fresh sushi you'll ever try. Izakayas: are gastropubs, after work bars, popular with salary men, where you come to drink sake or highball (Japanese drink of whisky and soda water) and order small inexpensive plates of food. Ramen bars: ramen is a seriously delicious and highly contagious meat or vegetable based broth with noodles and a variety of toppings. You can get a bowl from one of the many inexpensive ramen bars across the city, from as little as 800 yen ($8). For the best ramen bar, ask a local to point you in the direction of their favourite and check out Ramen Adventures for a deeper insight of the Tokyo world of ramen. 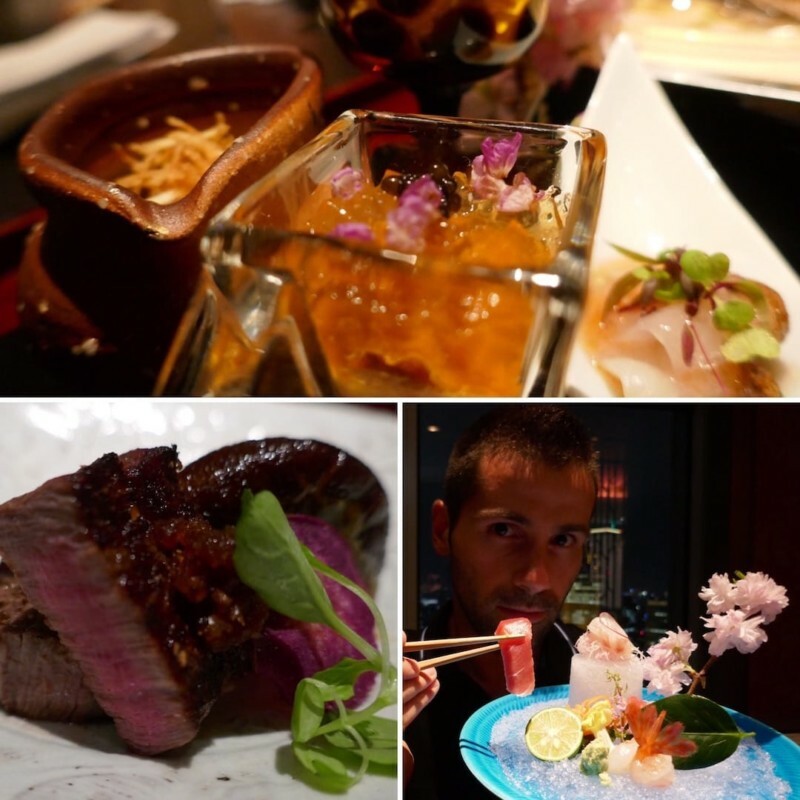 Kaiseki Japanese fine dining: involves many small plates of delicious Japanese prizes presented like works of art. We tried the Kaiseki at the Shangri-La's Nadaman restaurant, an incredibly romantic setting, dim lights, with jaw dropping views of the city. One of the dishes at the Nadaman includes the very famous and incredibly scrumptious wagyu beef. If you're looking for a gay-friendly tavel company to organise your trip to Tokyo and the rest of Japan, we've partnered with Out Asia Travels, an excellent gay owned travel agency, who offer tailored tours and itineraries. These guys are locals, passionate travellers and have a real insight of Japanese culture and the gay scene accross the country. They are offering our readers an exclusive 5% discount for bookings of 7 days or more when you quote NOMADIC5 in your enquiry. I cant stop laughing at some of these photos you guys look like you had a great time. I am going to plan to get one of those 7 day travel passes to save some cash..thanks for the tip! Have always so enjoyed following your travel adventures online and the destination guides especially. Wanted to write and say that, thanks to you, we used OutAsiaTravel to plan our recent 12 days in Japan. Shintaro-san (and Hiromi-san in America) were beyond outstanding in every way. Anyone reading this blog should take your advice and use them. They can help with whatever your desires – and budget – want to experience while in Japan. And then make all the arrangements. It couldn’t have been a more perfect trip. Thanks again, OutAsiaTravel and Nomadic Boys. THANK YOU guys for posting all of this incredibly helpful info. I’ve had Japan on my bucket list for many years now. And i am finally going to do it for my 45th birthday gift to myself. If not then by 50 for DAMN SURE…!!! LOL Anyway all the info was very helpful for me but what do you recommend for gay travelers going solo…? It’s such an overwhelmingly large city and as far as transit goes forget it i’d most likely wind up in Hokkaido…LOL I’d like to stay in Shinjuku for about 10 days and i’ve found a direct flight non-stop on JAL from Boston, MA to Narita. Two of the hotels i’ve been targeted for my stay are Toku Stay Shinjuku at the following address; 3-7-1 Shinjuku, Shinjuku-ku, Tokyo 160-0022 and the other being APA Hotel Shinjuku Gyoemmae at the following address; 160-0022 Tokyo Prefecture, Shinjuku-ku Shinjuku 2-2-8 Are these two hotels close to the gay map of Tokyo you highlighted in your article…? Also, who would you recommend hiring for a private gay or gay friendly guide once i’m there…? I did find one company online called gogayjapan.com that offers private or small group tours. Not sure how “reliable” he is or the company as a whole…? I definitely want to experience the Tokyo Sky Tower while i’m there and the Owl Cafe as i’m an avid birder and have been for the last 25yrs. So that would be very interesting to me being up close to the owls like that. I’m planning on $10k or $10,000 for my total trip expenses including flight, hotel, food, and a few day or evening excursions. Do you guys feel that would be enough for one person or would i need more then that…? Also, since i’ll be staying the bulk of my time in Shinjuku do i really need a JR Rail Pass or any train or subway passes. Or can i get by via taxi…? I know taxi’s are EXTREMELY expensive there but since i’ll be only using it for very short jaunts here and there i wonder what your thoughts are on that…? I’d much rather fly into Haneda but unfortunately there are no direct flights from my city of Boston, MA to there. The only way would be a layover from Boston to Toronto-Pearson airport and then over to Haneda. So the non-stop to Narita is far more appealing to me. However, i do know that i still have to get from the airport to my hotel and Narita is a bit of distance from Shinjuku. So i was thinking of using this service at the following website; http://tokyoairporter.com what are your thoughts on that may i ask…? Anyway that about covers most of my questions. If you guys could get back to me at my personal email address with some suggestions or otherwise. I would GREATLY appreciate it. Arigatou gozaimasu. Thanks for this guide you curated! Totally helpful! Thanks for such an amazing and concise guide. Leaving in three weeks. Now very excited! 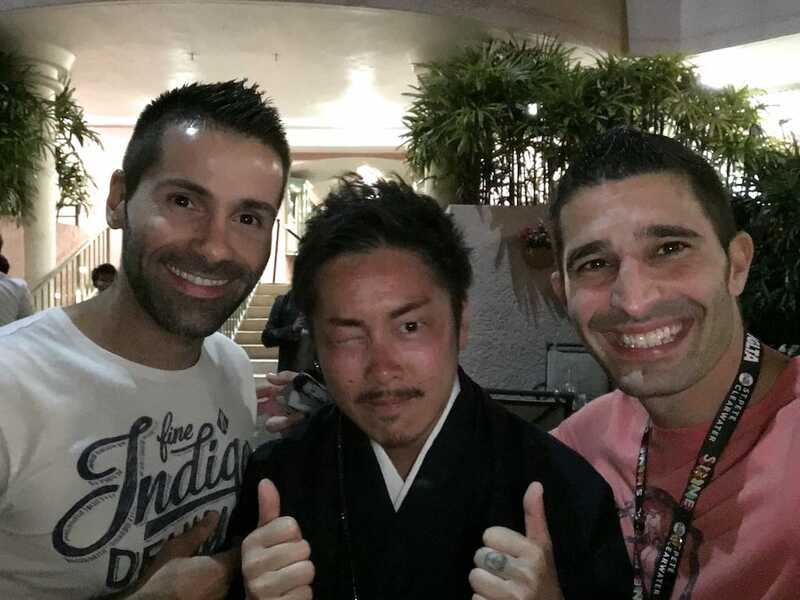 Absolutely one of the best Japan tour posts I’ve ever seen, the pleasure and fun is all so evident in your pictures and descriptions. I wouldn’t mind going back to Japan to seek out everything I’ve missed out from this list in Shinjuku. Great read! This post has made me so happy. I love that the gay scene is so big in Tokyo, and that it is so embraced. 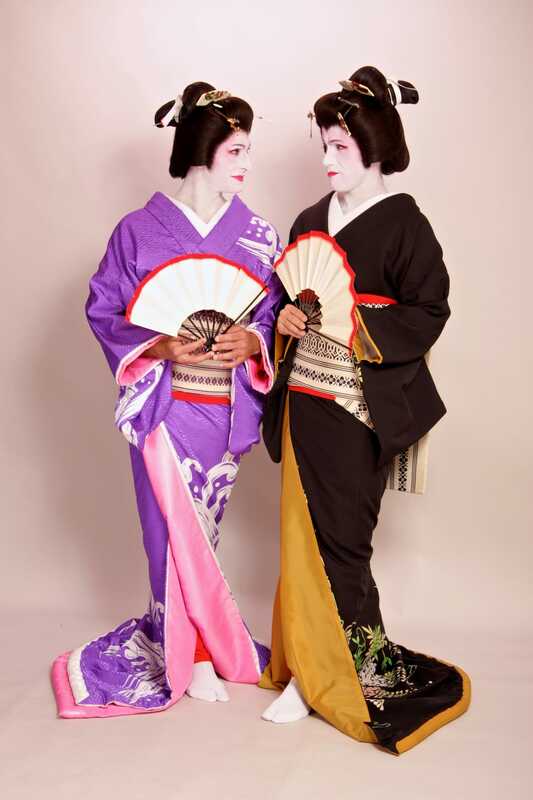 The photo of you two dressed up as geisha’s is the most amazing thing ever. You guys look so great in your Geisha get up. Good to see that Tokyo has become even more gay friendly. Looks like you had an incredible time – and oh my god the Park Hyatt looks incredible. You two make two good-looking geisha’s if I may say. So I did the point and hope trick myself and got lucky with a tasty bowl of ramen. One time I had to pick using a vending machine that dispensed tickets to give to the chef, also point and hope style. I love Japan and all of its quirkiness and I am so happy to hear that it is progressive and accepting of the LGBTQ community. It looks like you had a beautiful and excellent experience. Side note, I love your blog and I have a few friends who are going to love this even more. They’re going to be so happy when I send them your link. Happy Travels! What a fantastic and detailed guide. Very surprised to hear how open Japan is. That is so awesome. Your geisha dress up is hilarious. Very well done and fun. Happy travels! Oh my would love to be transformed into a geisha, seems like so much fun! I think my next trip to Asia is going to be Japan. I want to eat just about everything. I think I’d have to try both the food tour and cooking class. Plus that view from the Park Hyatt is breathtaking. Saving for when I start planning my trip. You look like you had such a fabulous time in Tokyo. And don’t you just look gorgeous in your kimono, just like the historical geisha. Almost wondering if there was an announcement coming at the beginning there .. maybe next time Stefan. Love that caption of the “love” photo! Ahah. Great resource, as usual. Will share this with a friend that’s headed that way soon. Thx Claire! You’re sure to have an ace time ? Great guide to for Toyko , all the needed information for the scene. You guys have a dream life. What an incredible adventure it must be. This looks truly amazing and how I would love to travel with you guys one day. I love the details that you share. Thanks again guys!! Thanks Balu! You’re gonna love it- amazing country.